It’s time to announce the winner of the fourth Madeleine Award for the use of symbol, stunt, prop, gesture or jest in international affairs. This annual prize began life at The Lowy Interpreter in 2009, and is named after Madeleine Albright, in honour of her penchant for sending diplomatic messages via the brooches on her lapel. The Madeleines are guided by the truth offered by the American grand strategist George Kennan: much that happens between nations is actually a form of theatre. On the international stage, states strut, signal and stumble, seeking to win through bluster and brio rather than bribery and bashing. All that effort needs to be both appreciated and graded. On The Interpreter, the first three annual awards went to a seaworthy climate change stunt (an island nation holding a cabinet meeting beneath the waves), a brilliant bluff by a US diplomat that helped clinch a peace deal, and to the extraordinary Franco-German double act at the heart of the Euro crisis. For the fourth annual Madeleines, The Strategist picks up this proud silly-season tradition and the quality of the contenders shows the enduring value of the award. To warm up, here are some of the minor prizes. The Philippines gets the Potemkin Village Award for erecting advertising hoardings to hide slums on the road from the Manila airport to the Asian Development Bank; 4,300 delegates attending a conference on poverty in Asia were spared the sight of shanties and open sewers. Recently minted Foreign Minister and well-read history buff Bob Carr couldn’t quite help himself on his first day in Beijing yesterday. We gather he has been voraciously devouring Chinese history in an effort to, shall we say, equalise his knowledge between that of our main military ally, the US, and our biggest export and trade partner… Carr’s opening remarks at his meeting with People’s Liberation Army No 2 General Wei Fenghe included a mention of his visit to the original Whampoa Military Academy in Guangzhou. Ahem. As General Wei was extremely quick to remind Carr, the famed academy was a KMT and not Communist training facility back in the 1920s. At which stage media were quickly ushered out of the room by nervous Australian embassy officials. Back to the books. Russia’s modern Tsar deserves a gong every year just for putting the Putin into play in so many different ways. Last year’s winning moment was Putin piloting a motorised hang glider over an Arctic wilderness to lead six endangered Siberian cranes to their winter habitat. Having to play the Putin way perhaps explains why the US ambassador to Moscow ‘lost it’ and ranted at a pesky TV reporter that Russia had ‘turned out to be a wild country!’ The Foreign Policy article on an Ambassador who-just-isn’t-going-to-take-it-anymore (video) is a wonderful illustration of the problems of being a diplomat in an undiplomatic age. Now to the contenders for the main award. Coinage is one of the oldest state symbols (defend the realm, protect the currency) and there was quite a bit of numismatic noise of a Madeleine kind. The People’s Bank of China put the country’s first aircraft carrier on a new commemorative coin, while the US Treasury said it won’t mint a trillion-dollar platinum coin to head off the battle between the President and Congress over raising the government’s borrowing limit. The ultimate melding of substance and symbolism in the coinage stakes, though, is to give up your own currency and adopt that of a neighbour. Iceland, thus, merits a mention for thinking about ditching the krona in favour of a more stable currency. Opting for the euro would open up new ways of defining the word ‘stable’ so many Icelanders prefer to turn their eyes across the Arctic towards the Canadian dollar. This rates as a glorious ‘loonie’ idea, a reference to the Canadian one dollar coin which bears the image of the loon bird. Canada makes a strong showing in this year’s award not for the strength of its currency but for its crafty creation of dog sled diplomacy. Diplomatic relations between Canada and the United Arab Emirates have been decidedly frigid since 2010 when Ottawa refused to grant requests from Etihad Airways and Emirates Airline for additional landing rights in Canada. The UAE evicted Canadian troops from a military camp outside Dubai, imposed a travel visa on Canadians and the UAE lobbied hard against Canada’s bid for a UN Security Council seat for 2011–12. The UAE claimed to have played a role in sinking that Canadian effort. How to repair the rift and suspend the spat? The answer was for Canada’s Foreign Minister to take his UAE counterpart out into the -6C temperatures to go dog sledding at a luxury resort near Ottawa. 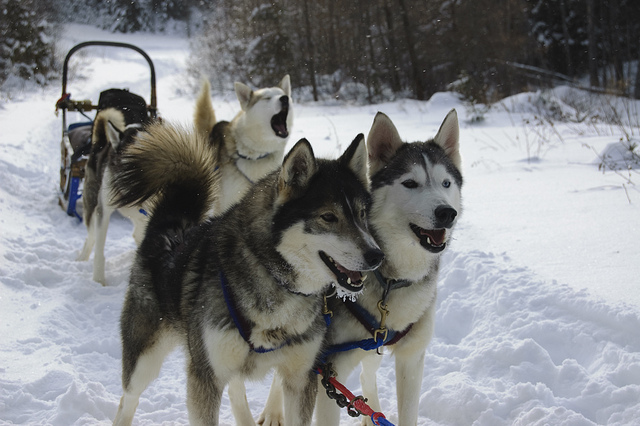 The huskies did the trick and the two Foreign Ministers brushed off the past as they sped over the snow. It was a winter excursion that helped warm up a once frosty relationship. It proved a testament to the power of personal diplomacy. Count that as a thaw in relations. Dog sled diplomacy slides effortlessly into the final round of the Madeleines; in a slower year, it might have triumphed. This, however, has been a bumper year for the use of symbolism and stunts, courtesy of one mercurial new player. Step forward North Korea’s young dictator, Kim Jong Un. The trouble with the hereditary Marxist dictatorship, as a US ambassador once observed to me, is that the North Koreans are cursed with a very shallow gene pool to draw from. Much is riding on the smarts of the third generation of the Kims to get the job, and he is signalling frantically to the outside world: attending a concert where an important US representative, Mickey Mouse, also appeared, raising female hemlines (miniskirts in Pyongyang! ), visiting restaurants that sell pizza, hamburgers and French fries, and ending speculation over his ‘mystery woman’ companion by announcing his marriage. Mark it all as gesture work of the highest calibre. Giving an award to North Korea, though, would be taking the light touch of the Madeleines to a dark and starving nuclear-armed place where negotiation via missile launch seems normal. The absurdity prize has already been taken out by The Onion anointing Kim Jong Un as the ‘sexiest man alive’ and then seeing its satire get a run as a straight report in the People’s Daily. We note, also, Madeleine Albright’s comment that when she met Kim Jong Un’s father, he was wearing high-heel shoes that matched hers for height and Kim Jong Il sported a hair-do with a bouffant even fuller than hers. Judging the import of North Korean reality is too big a job for this award. With Kim the Third relegated to second place, the worthy joint winners of the 2012 Madeleine Award can be announced. Both winners have a bear as the central element. One of the co-winners is the Swedish public relations firm that charted a small plane and flew into Belarus in July to drop hundreds of teddy bears with parachutes on the outskirts of Minsk. The teddies carried labels calling for freedom of speech and respect for human rights in one of Europe’s most repressive countries. The Belarus president was outraged and fired the generals in charge of the air force and border security. The other victor is Australia for using a chocolate version of a koala bear to get 140 votes and win two years on the UN Security Council. 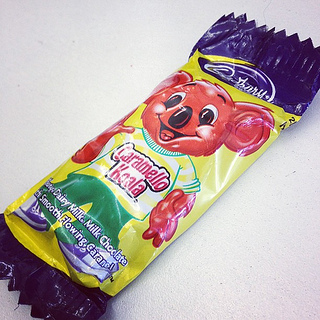 The Caramello Koala triumphed in New York. The surprise ingredient in Australia’s last-minute gift bags to the 193 permanent UN voting members was the chocolate koala, trumping Finland’s dried blueberries and Luxembourg’s small wooden models. Australia used its secret weapon to help win a temporary seat on the United Nations Security Council: chocolate Koala bears. The resource-rich nation gave each delegate at the UN vote in New York a candy version of one of its best-known animals. ‘We knew everyone was going to be there for a long time and thought a little bit of a sugar high might help things,’ said a spokesman for foreign minister Bob Carr. A teddy bear parachuting in for freedom and a chocolate koala serving Australian diplomacy at the UN—worthy joint winners of the 2012 Madeleine Award. Graeme Dobell is the ASPI journalism fellow. Images courtesy of Flickr users EveryDamnNameIsInUse and jamespoulter.